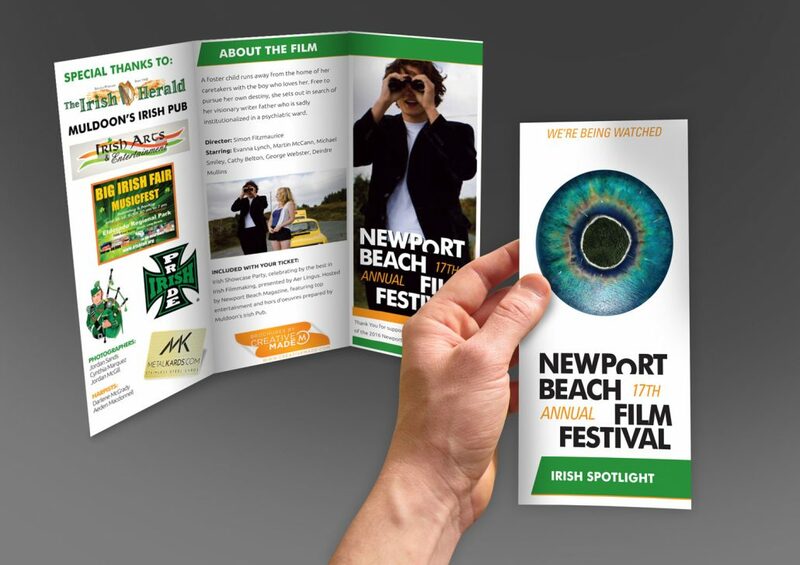 Join us tonight, April 24th, for the Newport Beach Film Festival Irish Spotlight. Join us tonight at Edwards Big Newport Theatre for the official Irish Spotlight presentation of “My Name is Emily” – along with the Irish Spotlight Gala afterparty. The movie has a great looking trailer, described as “A foster child runs away from the home of her caretakers with the boy who loves her. Free to pursue her own destiny, she sets out in search of her visionary writer father who is sadly institutionalized in a psychiatric ward.” After the event will be the Irish Showcase Party, celebrating the best in Irish Filmmaking, presented by Aer Lingus, and hosted by Denver Magazine, featuring entertainment and hors d’oeuvres by Muldoon’s Irish Pub. This year we’re sponsoring the entire Newport Beach Film Festival, which is our 5th year in a row sponsoring the prestigious festival celebrating the best in international filmmaking. For the Irish Spotlight we prepared, designed, and printed brochures unique to this single event, along with a plethora of marketing and display advertising pieces for the overall film festival. Working with the #NBFF every year has been a privilege, as a way for us to help celebrate the arts as well as giving back to our local community in Denver and Costa Mesa. We work closely with not only the film festival, but many of the other sponsors featured in the event to ensure the project and execution give a unique experience to the guests and patrons of the festival, while also helping secure and promote fellow businesses that are also gracious enough to sponsor this non-profit. If you have a chance, join us tonight! Additionally, we fully encourage anyone and everyone to check out the selection of films at this year’s Newport Beach Film Festival, as the festival goes on all week – there a ton of great films, over 350 at the entire festival, with plenty more to choose from and a unique night that is perfect for any date or to meet new friends and network. See you there!